Chembra peak, located in Wayanad district is an alluring tourist spot grabbing thousands of visitors from all over the globe. It is an ideal place for trekking. Spectacular views of cool misty mountains and hills from the top of Chembra peak captures all eyes. Chembra Peak, a part of Wayanad hill ranges in Western Ghats is a famous picturesque spot sited in Kerala. This huge peak enclosed in lush greenery is considered as the highest peak in Wayanad. It stands at a height of 6900 ft above sea level touching the cool misty clouds. You can easily reach this destination by travelling a distance of 8 km from Kalpetta. Today, Chembra peak is one among the best known tourist spots in Kerala promoting tourism. It is a favourite destination of trekking lovers. For assisting tourists, Chembra peak is provided with expert travel guides and trekking equipments. 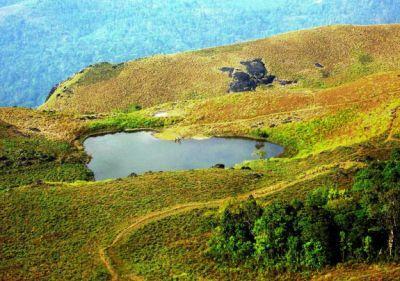 When you reach at the top of Chembra peak, you can see a small heart shaped lake. Fabulous view of rocky hills and mountains from Chembra peak presents an astonishing view for tourists. If you wish to stay at the top of Chembra peak, temporary camps are available for tourists assistance. Breathtaking view of enriched greenery from the top of Chembra Peak is really remarkable. You can also get trekking supports like sleeping bags, canvases, huts and trekking implements on hire from Chembra peak. On the way to top of Chembra peak, one can enjoy the scenic beauty of pepper plants and beetel tress depicting the gorgeous landscape of God's own country.